Before his rise to The Gambian presidency, little was known of Adama Barrow, who was finally installed in the post in December last year. The incumbent, Yahya Jammeh, who had ruled for 22 years, tried to dispute the election, and Barrow had to be sworn into office in the country’s embassy in nearby Senegal. Barrow is faced with a task of righting the country’s brutal political past under his predecessor, which included shooting of protesters, unlawful detentions, torture of prisoners and repression of the media and lesbian, gay, bisexual and transgender people. It is a process he started slowly, and after three months in office his public ratings were low, especially on social media. “President Barrow’s first 100 days have included some momentous steps forward for human rights in The Gambia, but there remains a huge amount to do in order to make a decisive break with the country’s brutal past,” says Amnesty International’s West and Central Africa director Alioune Tine. 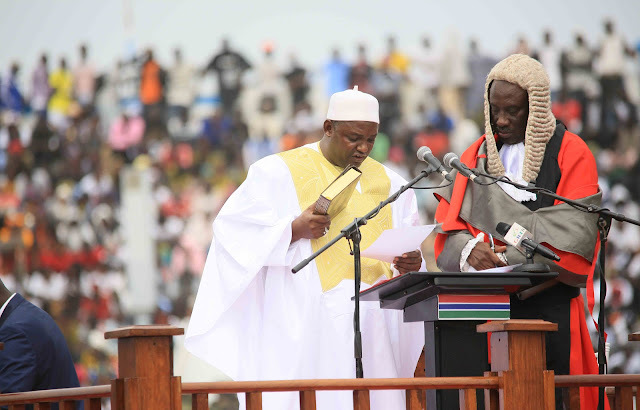 The new president hails from Mankamang Kunda, a small village in Jimara district, The Gambia’s Upper River Region – more than 300km from the capital, Banjul. Born in February 1965, he went to study in Banjul in 1981. The poor West African nation offered little or no opportunities for higher education for rural youth at the time, and rural poverty in the country has yet to be tackled. Fifty-two years after independence, the World Bank ranks The Gambia as the 8th poorest country in the world, with a GDP per capita of $488.60. Nearly half of the country’s population of 1.8 million lives under the poverty line of $1.25 dollars a day. The UNDP’s 2016 Human Development Index ranks the country at 173 out of 188 countries. The Gambia performs poorly in the human development index because education, health care and living standards are declining, says Abdoulie Kurang, a development studies lecturer at the University of The Gambia. “Barrow has to ensure that the education system is reformed to enhance quality, ensure more teachers are trained and well paid. He needs to pump more resources into the sector,” he says. Moreover, the education system is “biased” in that it mainly prepares individuals for jobs in the public sector. It should also enable individuals to be job creators, Kurang says. Meanwhile, The Gambia has seen an increase in healthcare infrastructure in the past 22 years. In that time, the number of referral hospitals increased from two to five, while 40 new health centres were built across the country. But poor people’s access to healthcare is still limited by a lack of drugs in the public sector. “It does not make sense to go to a public hospital where you are given a script for drugs that you have to buy at a private pharmacy, something which is quite expensive for ordinary Gambians,” Kurang says. After completing high school in 1988, Barrow worked as a salesman and sales manager at Musa Njie and Sons Holding Co. Ltd, dealing in the importation of gas bottles, clothing, food, and soft drinks. After that he spent four years in England, where he studied real estate while working as a security guard for Argos, a multi-product food and non-foods retailer in London. Barrow returned to The Gambia in 2006 to start his own enterprise, Majum Estate Agency, of which he was chief executive officer. He has promised to reform the civil service, which would include a review of salaries, and create more jobs for the country’s youth. “The focus of our civil service reforms are job security and review of salaries,” he told Al Jazeera in December, shortly after he was elected. The minimum wage for civil servants is D1000 ($25) a month. Salaries were last increased in 2010, by 20%. Commentators say the government must develop labour market regulations guaranteeing wages that are commensurate with actual rises in the cost of living. Issues of gender inequality will also need to be addressed, says Kurang. Female participation in the labour market is 72.2% compared to 83% for men, according to a 2014 report by the UNDP. Meanwhile, unemployment among the youth remains high at 29.80% and this figure has been projected to reach 37.4% by 2020, according to a Trending Economics forecast. To achieve even some of this, Barrow will have to take on an uneven political playing field that gives much advantage to incumbency. He probably knows this, having been involved in opposition politics since 1996 when he joined the United Democratic Party (UDP). He contested, but lost in the National Assembly elections in 2007 in the Jimara Constituency, in which he sought election on a UDP ticket. He was the party’s deputy treasurer before his selection in September 2016 as the party’s presidential candidate. Though he has been involved in politics for two decades, Barrow had never held elected office until he took power last year. He got his first chance to lead in September 2016, when his party’s entire executive committee was arrested by Jammeh’s government over peaceful protests for electoral reform. He was subsequently elected to lead a coalition of seven opposition parties regarded as “the most credible challenge” to a government that some have described as “one of Africa’s most brutal dictatorships” and “the worst dictatorship you’ve never heard of”, as the American human rights activist Jeffrey Smith puts it. Ismaila Ceesay, a Gambian political analyst says one of Barrow’s major challenges is maintaining peace and security. Indeed, Barrow has also promised reform of the country’s national intelligence agency, which has been implicated in numerous human rights violations, including torture and disappearances. He has been credited with tackling troublemakers at high street shops in London, where he is said to have once made a citizen’s arrest of a shoplifter while working as a security guard. But the new president has bigger security issues to deal with, as violence erupts intermittently between his supporters and those of the former president. A recent incident, involving the Gambian army and ECOMIG forces at Jammeh’s former residence in Kanilai, which saw the shooting of three Gambian army officers by a Senegalese soldier, has only increased tensions. Barrow’s government blamed the incident on miscommunication between the two sides. Barrow’s father is Mandinka and his mother Fula. He is married to two women from the Fula ethnic group and has five children. Tribalism will have no place in the new Gambia, he has said, adding that two of his sisters have married into the Jolas, Jammeh’s ethnic group. The Gambia’s annual GDP is growing by an average of 4.3%, but the ministry of finance said the figure is expected to reach 4.6% in the long term. Despite this, Jammeh left the Gambia’s economy “completely destroyed” according to Amadou Sanneh, the new minister of finance. Under his rule, the country has accumulated more than $1 billion in debt, while its gross official reserves stand at only $68.75 million. Net international reserves are at $20.81 million, which represents less than two months of import cover, according to Sanneh. “This clearly shows that the economy of the Gambia has been completely destroyed,’’ Sanneh says. Jammeh is also said to have stolen up to $100 million from government coffers before his departure. He is now living in exile in Equatorial Guinea, which is ruled by another of Africa’s more notorious long-term rulers, Teodoro Obiang Nguema Mbasogo. Barrow now faces the task of restoring democracy and good governance in the tiny West African country, which has been left in virtual ruin by its previous ruler. The author, Modou S. Joof, is an award winning freelance journalist based in Banjul, The Gambia. He is a journalism trainer, a stringer for the Voice of America (VOA), and a news editor at Front Page International (FPI). He is currently studying Political Science at the University of The Gambia. Joof use be a managing editor of The Voice newspaper in Serekunda.